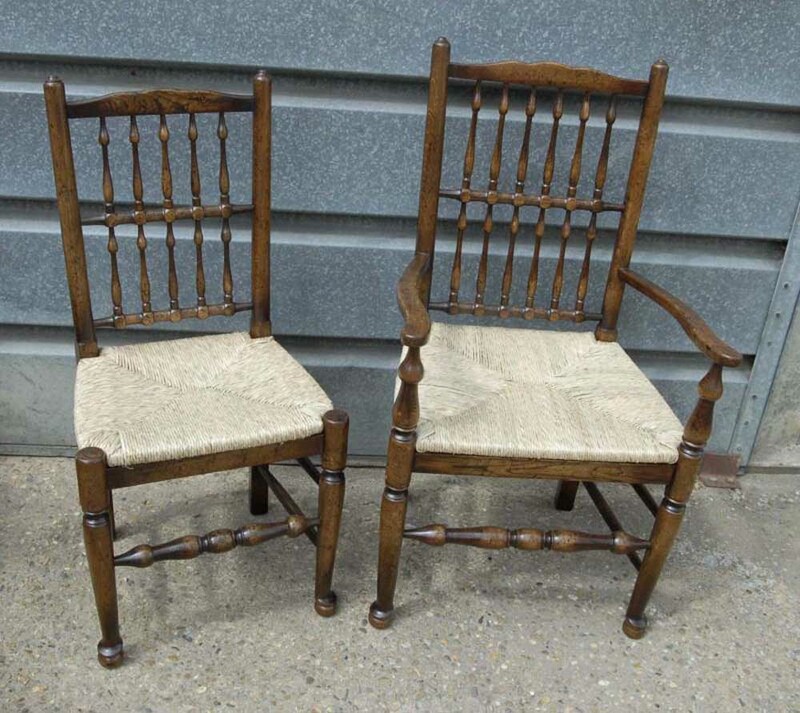 You are viewing a pair of English oak spindle back chairs consisting of one arm chair and a side chair. They are the ultimate dining chair and have the flexibility to also suit the kitchen. I have a similar set in my dining room at home of which I have included a picture to give you an idea of how they look. They are hand woven rush seats too so they are very comfortable to sit on. This pair have just come back from the restorers where they had a repolish and the seats were re-woven with rush. The grain of the oak has a lovely finnish to it and the repolish has really accenuated the beautiful grain and burl of the wood – they have really come up a treat and are ready for use in your home immediately. The stretchers are lovely hand turned. We can sell these as a pair – we also can sell these chairs as sets of four, six, eight, ten, twelve…please let us know your requirements. Due to the high levels of craftmanship these chairs are ready for home use straight away. We have various farmhouse tables to match these chairs so please let us know if you are looking for a set.